Among the amazing food discoveries of my recent life, this one is certainly up there: A little grocery store very near me in Brooklyn sells kimchi. Lots of it. It’s the good stuff, too –pungent, spicy, tart and tangy. But what this means is that the sous chef and I have been eating a fair bit of the stuff. What to do with kimchi? We ran through the obvious in the first several meals — kimchi omelets, scrambles, kimchi with rice, porridge. You name the easy, we tried it. Kimchi fried rice, however, was daunting to me. 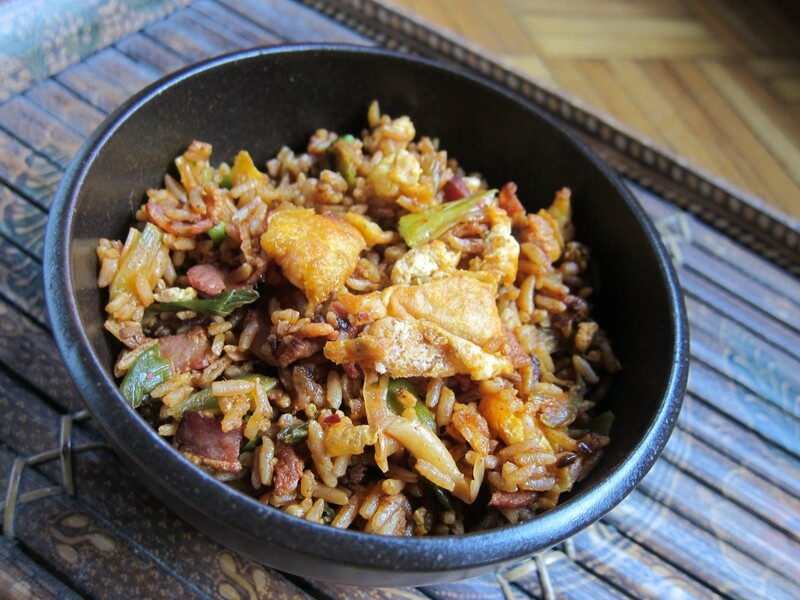 Fried rice was the very first Asian dish I tried to make — and if you’ve read A Tiger in the Kitchen, well, you might recall the outcome of my first attempt. When I read about New York chef David Chang’s fervent belief in bacon and kimchi being made for each other, though — and how he uses it in fried rice — I was sold. You could say I haven't exactly been the kind of daughter-in-law a Korean mother would have wished for. I can't speak Korean. (I don't think being able to say "kalbi" and "bulgogi" counts.) And while I'm awfully good at eating Korean food, well, making it is another matter entirely. I'd never attempted many Korean dishes simply because they seem terribly complex — each stew, each grilled meat I sample is always bursting at the seams with complicated clusters of flavors. How could I ever replicate those tastes in my little Brooklyn kitchen? No, no, it was always far easier to just throw in the spatula and hop on a train to New York's Koreatown. After spending some time in the kitchen with my mother-in-law in Honolulu for book research last year, however, I started to come around. Since she lives in Hawaii and I live in New York, it's been impossible to keep the lessons going. So I've been turning to a blogger whom I deeply admire — and adore — who's essentially a one-woman Korean cooking school: the irrepressible Maangchi.